Asakusa (淺草) is the most popular tourist spot in Tokyo. 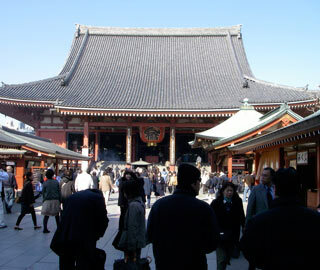 The history of Asakusa as the tourist spot began even before the Edo period. The town was developed as Monzen Town of the Senso-ji Temple. During the Edo period, because of Sankin Kotai which made all Daimo, the land-master, have to visit and stay certain amount of time in Edo, Asakusa became major spot in Edo. Today, still many people visit Asakusa. Nakamise Shopping district has many gift shops.